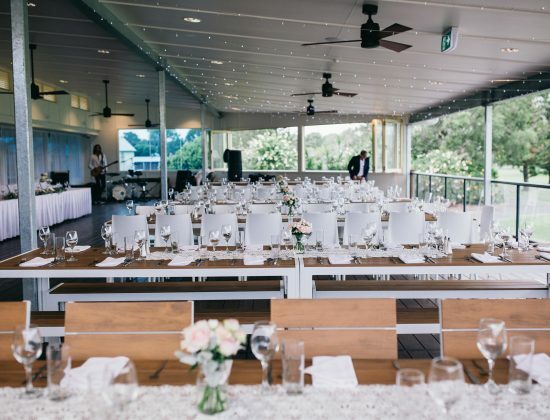 Newly renovated and extended, The Deck is Yamba’s latest favourite wedding venue overlooking our stunning golf course, and is now fully undercover, making it an all weather venue. It can seat up to 80 – 90 if setting a dance floor and bridal table, or up to 200 cocktail style. Our brand new Deck Bar offers 16 beers on tap and has a comprehensive wine list. The Deck is the also the perfect spot for your guests to enjoy pre dinner drinks and canapés prior to a Wedding in the Auditorium. Our Golf Course provides the perfect backdrop for your Yamba wedding photographs with a combination of manicured greens, rainforest, native paperbark trees, natural bush and water vistas. Relax and let our experienced Weddings Manager and our team take care of you on your special day! Call us now to discuss your requirements and to book a tour of our facilities located close to the centre of Yamba.